Kindergarten Graduation song complete with original lyrics, suggested props and actions as well as well as teacher directions for incorporating this song into your classroom celebration. Easy to adapt for pre-school graduations too. "Yay For Kindergarten".. one of our favorite kindergarten graduation songs! 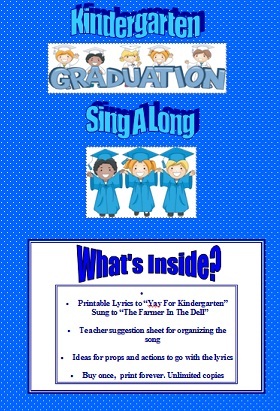 Our 5 page packet includes the complete set of lyrics that can be printed for distribution to the students, a list of suggested props and/or actions for each verse as well the directions on how to organize this fun Kindergarten Graduation song into your classroom celebration.